With a full year of end-to-end 3DTV tests under its belt, SES WORLD SKIES is uncovering some eye-opening results. Blue chip networks and television manufacturers are gleaning valuable insight from the first-of-its-kind collaboration. After attending so many CES (Consumer Electronics Show) events, youd think wed resist being swept away by the buzz. Sure, after last years show, all we saw was 3D. They swore all the pieces were in place. And we believed it. Darn!!!! The past couple have years have not been good for pay-radios prospects in Europe. Weve seen the Worldspace catastrophe, now well over two years into its Chapter 11 bankruptcy (WS filed in October 2008) and with legal bills still running into the hundreds of thousands of dollars a month. Mark Brender manages all facets of the foundations affairs. He has held this position since GeoEye established its foundation in March of 2007. From January 2006 until October 2010, he also served as the Vice President of Communications for GeoEye. Prior to joining GeoEye, he was the Vice President of Communications and Washington Operations at Space Imaging. Mark has more than 25 years of experience in public affairs, broadcast journalism, government relations, business and the military. In 1998, prior to joining Space Imaging, Mr. Brender was a broadcast journalist for ABC News, spending 16 years at the network as an assignment editor, national security editorial producer, and radio correspondent. Before his ABC career, he served in the U.S. Navy as a public affairs officer and is a retired Naval Reserve commander. As a naval office, he also served as a White House Military Social Aide to the President of the United States. Mr. Brender began writing and speaking about high-resolution commercial Earth observation as early as 1985 when he established the Radio and Television News Directors Association (RTNDA) Remote Sensing Task Force. The task force helped clear the way for high-resolution imagery to move from the defense and intelligence sector to the commercial sector. Greg Ewert joined Iridium in 2004 and is responsible for business development for Iridium as well as its relationship with its distribution channels. Mr. Ewert brings 19 years of experience at senior-level positions in the global communications industry. Prior to joining Iridium, from 2002-2004, he served as Executive Vice President for Marketing, Sales, Product Development, Business Development and Customer Service for COMSAT International. Prior to COMSAT, from 1998-2002, he held executive positions within Teleglobe Inc., ranging from Senior Vice President of Global Data Services to Vice President and General Manager of Carrier and Emerging Markets. Before Teleglobe, he worked for Sprint from 1987-1997, where he held various positions including President of Sprint International of Canada. The variety of digital video formats being deployed today is in direct response to consumer demand for more program choices across multiple platforms such as Over-the-Top and Mobile TV applications. Content providers are turning to these advanced formats in an effort to reduce bandwidth, increase HD content, and add additional services while maintaining operational expenses. Digital television transmission, whether it is terrestrial, IP, or via satellite, depends highly on efficient use of compression codecs and transmission schemes. Bandwidth is another important factor that must be considered since an increase in bandwidth comes at an additional  and fairly significant  cost. Making the best and most efficient use of available bandwidth is critical to providing the additional HD programming and services consumers demand. 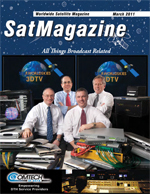 Both in scale and scope, satellite services are expanding. The footprint is growing as operators extend coverage via new satellite launches and more effective use of existing fleets. More and more consumers and businesses are coming to rely on satellite as a way of linking to the world from locations where cable infrastructure is not available  at sea, on the move, or in remote locations. And the use of satellite communications embraces an ever-growing variety of applications, right down to the consumer level. The benefits of Solid State Power Amplifiers (SSPAs) versus Traveling Wave Tube Amplifiers (TWTAs) have been discussed continually over the years. In the past, this was always in the context that TWTAs had better efficiency and size/weight, while SSPAs brought other significant advantages, such as linearity, reliability and lower lifecycle cost. Emergencies rarely occur on schedule. Comms and power equipment must be ready to handle critical needs at such times. One answer just may be the just released by Squire Tech Solutions is their pCom 300, a mission critical power communications trailer system for government and private industry mobile infrastructure needs. Every June since 1997, Southwestern Adventist Universitys Dinodig Project has sent research teams to eastern Wyoming to excavate dinosaur bones. The isolated quarry site has one of the worlds densest dinosaur bone beds; the remains of as many as 10,000 animals are buried there. The University is conducting world class taphonomic research, which studies the precise location of dinosaur bones, to understand how the dinosaurs died. This research requires sending data and photos from the remote site back to Southwestern Adventist University daily.